hosted by Jeroen Lenaers MEP. MEP Jeroen Lenaers opened the meeting by commending – once again – the high turnout and ongoing interest in the work of the Interest Group. He said that, so far, the Interest Group has been ‘more than just a talking shop’ and has achieved some tangible results in the form of amendments to the EU Strategic Framework on Health and Safety at Work, for example. He said the recently launched Written Declaration was another step forward in successful advocacy for those affected by neurological and chronic pain conditions, in relation to employment issues. Antonella Cardone began by emphasizing the link between health and work: ‘Good work has been shown to improve health outcomes, and good health enables people to be productive workers,’ she said. However, there is a lack of integration between health systems and employment and welfare policy – which must be addressed. She stressed that a focus on health at work is more important than ever due to the ageing workforce, later retirement and the increasing prevalence of chronic diseases. If people are expected to work longer, then more must be done to ensure that they are healthy and capable to do so. This, she said, illustrates why work should be regarded as a clinical outcome – which is often not the case in practice. In reality, she said, we see that a health care system perspective is taken – covering only those costs and benefits of immediate relevance to the health care system. However, she said that return on the investment can – and should – be also shown through productivity, job retention or Return-To-Work. She also stressed that health investment decisions should consider the therapeutic benefits that good work can bring. It should explore, too, how early interventions – such as reasonable accommodations at work – can play a significant role beyond drugs and devices. Although health and labour market policies are often formulated independently of one another, this chapter has shown the need for greater intersectoral collaboration. Both labour market and health outcomes would greatly benefit from improved policy integration. Note: The Written Declaration encourages the collaboration of DG’s SANTE, ECFIN, EMPL AND REGIO around workplace issues for those affected by chronic conditions and will be followed up in the ways suggested above. Boglárka Bóla spoke about the main findings from EU-OSHA’s ´Rehabilitation and return to work: Analysis report on EU and MSs policies, strategies and programmes´. Countries that have put in place integrated systems for rehabilitation and return-to-work have generally inscribed it into a broader policy framework which tackles the sustainability of work and the need to retain people longer at work in good and healthy conditions. Early intervention in the return-to-work process is another critical success factor. The longer a person stays off work because of a health problem, the lower are their chances of returning to work. The new Fit for Work advice services implemented in the UK for instance proposes assessment of working capacity four weeks after the person has been placed on temporary work incapacity. A tailored approach for a person affected allows information about the worker’s occupational and personal history to be taken into account, in order to create an individual plan with adapted measures for rehabilitation/return to work. Interdisciplinary teams, including medical and non-medical professions, should work together to determine the appropriate pathway for the worker’s reintegration into the workplace or labour market. The team should be led by a case-manager, and the employer should be involved in all discussions/decisions-taken. She said that there already exists EU legislation on access to employment, supplemented by some good practice examples at the national and company level. These best practices should be shared, and the relevant legislation and available resources also promoted to ensure implementation. The Written Declaration encourages the sharing of best practice, the implementation of existing legislation encouraged (e.g. via the European Semester recommendations) and the promotion of EU instruments e.g. the European Social Fund to support such actions. Following the presentations, there was input from the floor. Contributions included Paul Bart from the Dutch Fit4Work Coalition, who presented a Declaration which they had produced on the topic. 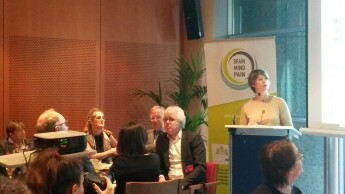 Prof. Chris Wells, President of the European Pain Federation also spoke about the role of the medical profession in ensuring the return to work of patients. He said that this was one of the work-streams of the Societal Impact of Pain Platform (SIP) and an area in which he would personally take the lead. He gave his commitment to ensuring that European pain specialists focus on return to work as a patient preferred outcome of treatment. The meeting was closed by MEP Elena Gentile, a co-author of the Written Declaration who encouraged all present to get involved in supporting this important initiative.